For over 50 years, Truxaw and Associates, a civil engineering and land surveying firm, has been serving public agencies, property owners and land developers throughout the West. Truxaw specializes in entitlement services, grading, drainage, street, sewer, water and utility design, ALTA surveys, topographic and boundary surveys, mapping, construction surveys and construction support. Clients include public agencies, developers, cemeteries, religious organizations, lenders, title companies and general contractors. Truxaw has successfully completed over 5,000 projects in California, Arizona, Nevada and Texas, giving the firm experience working with over 400 public agencies to negotiate project approvals. Mr. Truxaw’s 40 years with Truxaw and Associates encompasses every aspect of the firm’s professional land surveying and civil engineering services. Joe specializes in land surveying and mapping, construction surveys, ALTA surveys, cemetery development, boundary analysis and project management. He has effectively implemented state-of-the-art surveying and civil engineering automation, including the use of robotic total station-data collection/stakeout field technology and AutoCAD Civil 3D design and drafting software. He is experienced in the use of GPS surveying methods and coordinates GPS services for the firm. He is also responsible for civil engineering design on many of the company’s projects. This work includes feasibility studies, grading and drainage design, utility design, street improvement design, earthwork and project management. Mr. Hager joined Truxaw and Associates in 1975 and is actively involved in providing the full range of civil engineering and land surveying services offered by the firm. He is in charge of surveying projects and also manages the civil engineering design of many development projects. Steve has gained extensive experience on over 400 different sites, each with specific civil design and surveying requirements. He has assisted in developing the firm’s varied practice, which includes commercial and industrial projects, custom homes, fast food restaurants, shopping centers, automobile service centers and manufacturing facilities. His particular specialty is finding solutions to challenging grading and drainage problems. He brings his considerable experience with complex sites to the development of workable solutions for demanding grading and drainage problems on previously “unbuildable” sites. Mr. Hager has proven himself as an effective team member assisting developers, government agencies and contractors to bring a project from conception to completion. In his capacity as Vice President of the firm, Steve manages the civil engineering and surveying projects under his guidance. With over 35 years experience in civil engineering, including 25 years with Truxaw and Associates, Mr. Truxaw is an active leader in the management of civil engineering projects for public agencies and private developers. His experience includes engineering and project management on public works, multi-family residential, commercial and industrial projects throughout Southern California. Bill’s design expertise includes hillside and flatland grading, erosion control, water quality management, storm drain, water, sewer and street improvement design as well ADA compliance, storm water pollution prevention and cost estimating. Mr. Truxaw is also experienced in contract administration including preparation, negotiation, and administration of privately and publicly funded contracts for street and grading improvements. Mr. Di Bias has over 25 years of experience as a project engineer with Truxaw and Associates. His major responsibilities include: grading and drainage plan design, street improvement plans, underground utility plans, topographic and boundary surveys, parcel maps, project management, project administrations, evaluation of change orders, field supervision and survey inspection and coordination. Craig’s experience with various clients and public works agencies make him an invaluable member of the Truxaw team. 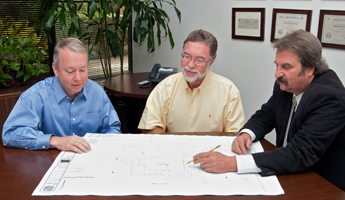 Mr. Deal has over 25 years experience in the land surveying and civil engineering profession. His career started with the County of Orange Survey Division in 1988. While at the County, he worked with state of the art equipment on large scale capital projects including roads, bridges, dams and hydrographic surveys. He worked at Orange County’s John Wayne Airport as a member of the Divisions airport survey crew for several years. At Joseph C. Truxaw & Associates Joe has worked 14 years as a party chief, and now in his current position as Survey Coordinator. Joe’s responsibilities include scheduling crews, communicating with clients, survey calculations and CADD drafting. Ms. Felker joined Truxaw and Associates in 1990. With her prior experience, she now holds over 30 years of accounting expertise. As Controller of Truxaw and Associates, Patty is an invaluable member of the Truxaw team. She handles all financial operations, is responsible for Human Resources and oversees our administrative staff.